WAS A "MICRO-NUKE" WARHEAD USED IN BALI BLAST? Subtitle: This original article has stimulated such a backlash within certain Establishment websites that we believe we must have hit a sensitive nerve! Certain lies have been told that need refuting, and we have decided to publish our mathematic calculations and government statistics that led us to believe that the Bali Blast might have been a "micro-nuke" warhead. We have placed these update sections at the end of the orginial article. 2. The Illuminati does nothing really important unless they have first tried tested it to ensure that, when the time comes for the major event to occur, it will occur absolutely as planned. 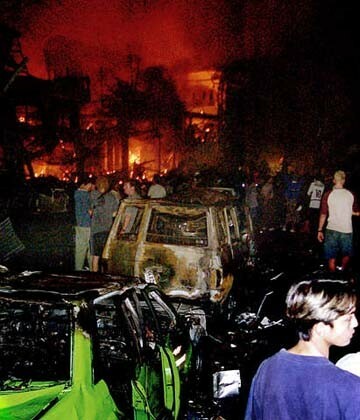 NEWS BRIEF: "At Least 188 Killed in Bali Nightclub Bombing; 2 Americans Among Dead", Fox News, October 13, 2002. "BALI, Indonesia  Two Americans were among the 188 clubgoers -- many of them foreign tourists -- killed in Bali Saturday night in a double terrorist bombing, the State Department has confirmed to Fox News. The island paradise was the scene of chaotic exodus after the bombing, possibly linked to Al Qaeda, which wounded more than 300. Three Americans were among the injured. Many of those killed by the two bombs that tore through a nightclub district on the island were Australians as well as other foreigners from Canada, Britain, Germany, and Sweden." After enduring the macabre news about a great number of Palestinian suicide bombings against a large variety of buildings over the past 20 years, I was taken aback by the huge number of casualties of this blast in Bali; I do not ever remember a casualty toll as large as 188, and possibly climbing. I also do not remember that some of the survivors had their skin falling off, for that is a symptom of a nuclear blast. Let us continue with the news story. "The destruction started when a small homemade bomb exploded outside Paddy's Discotheque in the maze of clubs and bars on Kuta Beach, a popular haunt with young travelers. Shortly afterward, a huge blast from a bomb in a Toyota Kijang, a jeep-like vehicle, 30 yards down the street devastated the crowded Sari Club, a surfers' hangout. A third, smaller bomb exploded outside the U.S. Consular office. No one was injured in that blast. The second blast ripped into the open-air bar, triggering a massive burst of flames that officials said was caused by the explosion of gas cylinders used for cooking. The explosion collapsed the roof of the flimsy structure, trapping revelers in flaming wreckage. The explosions and fire damaged about 20 buildings and devastated much of the block." As this paragraph correctly states, the blast was "huge", and it triggered "a massive burst of flames". Officials attempted to pass this fireball off to gas cylinders used for cooking, which may or may not be true. However, we do know that the blast triggered an exceedingly powerful torrent of air that collapsed the roof, trapped many in the now burning wood, and damaged as many as 47 buildings in the vicinity. That is quite a lot of destruction to occur from a conventional blast set off from a jeep-type vehicle sitting on the street.
" 'All the buildings in the vicinity just collapsed, cars overturned and debris from the buildings fell on them, he [a bystander] said, without giving his hometown. 'I have never seen anything so horrible. There were so many people, 18 to 20 year olds, people in pieces all over the street. 'New Zealander Lonny McDowell, 25, was at Paddy's when the blast blew chairs and concrete through the bar. He said he saw a man with no legs and another with a cable stuck through his stomach." Once again, the destruction, the death toll, and the devastation seems too large to be caused by conventional explosives. Let us now review another article for yet more information. NEWS BRIEF: "Indonesian Nightclub Bombing, Called an 'Act of Terror", by Fox News, October 12, 2002. "The explosion went off about 11 p.m. ... Witnesses on the popular tourist island said that the flames spread to another club and burned several other buildings on the same block and a dozen cars. The place was packed, and it went up within a millisecond ..."
This word, "millisecond" stuck in my throat, for that is a word normally reserved for nuclear explosions. Once a warhead goes critical, the chain reaction occurs in milliseconds, as does the resulting destruction. This blast seemed unusually huge and destructive. "Australia tourist Rachel Hughes, 18, said she and a friend had just arrived in Kuta when the blast occurred. Standing in the foyer of the Bounty Hotel, 'people were just walking in, blood dripping off them, burns to their face, skin coming off them,' she told Australia's Seven Network." 2. Muslim terrorist groups love to take credit for a blast they have successfully carried it out; however, no group stepped forward to take public responsibility. Surely, they would love to take credit for such a successful terrorist attack as this one! Notice that the National Police Chief of Indonesia was the one who claimed the blast was a terrorist blast. Immediately after his statement President Bush and other Western leaders issued calls for more strident measures to be taken against "global terrorism". NEWS BRIEF: "Micro Nuke Used in Bali 'Terrorist' Lookalike Attack", by Joe Viallis, Friends of Liberty, October 14, 2002. "At 11.05 p.m. local time on Saturday night, a giant blast scattered pieces of the Sari Nightclub right across Kuta Beach in Bali, Indonesia. Though two other synchronized blasts shook the American Consulate and a Philippines travel agency office at exactly the same time, there were no injuries or deaths at these other locations, both of which served as mere flash cards to reinforce the unexpected presence of Al Qaeda in this beautiful tourist paradise ... So far as I am aware, the Muslim world does not yet have access to a sophisticated Special Atomic Demolition Munitions [SADM], one of which certainly went critical in a sewer more than four feet below the road bed outside the Sari club. Within five microseconds of detonation the awesome million-foot-per-second shock wave hurled two tons of road bed and sand particles upwards and outward in a deadly fan, cutting tourists to bloody ribbons and hurling body parts for several blocks." Certainly, if a tourist saw a "large white mushroom cloud" in the distance over the blast, that is a solid indication that a nuclear device had been used. Perhaps one reason for detonating this bomb so late at night would be to minimize the numbers of people that would actually be outside to witness the white mushroom cloud. "Photographic evidence proving the use of an unconventional weapon was edited out almost immediately by the major media, though not from the amateur video camera which provided the picture at top center above. It alone shows the deep crater being probed by Indonesian police and military with a [very long] pole. The very presence of the crater itself proves the weapon was detonated sub-surface, while the craters depth in combination with its diameter, prove the depth at which the weapon was initially placed." Thus, if this bomb was placed underground, then the story of the blast occurring from a bomb placed in a "jeep-like" vehicle are as phony as the story that the devastating blast damage at the Oklahoma City Murrah Building was caused by a fertilizer bomb placed inside a Ryder Rental truck parked outside! The officials in charge of a disaster scene do love to provide phony facts that get people looking in the wrong direction for the wrong culprits in order to arrive at the wrong conclusion! Thus, in the Beltway Sniper shootings, "witnesses" are reported to have seen people leaving the general scene of a shooting in a white van, or was it a white box type delivery truck? The reality is that a skilled sniper probably would be using a breakaway rifle that he can break down on the spot and carry out of the area inside a lightweight jacket so that he would never have to get into a vehicle, much less a white truck. NEWS BRIEF: "Bush calls for action after Bali blast", Business Day, http://www.bday.co.za/bday/content/direct/1,3523,1199284-6078-0,00.html, 15 October 2002. "At the scene of the Kuta blast, about 300 metres of street looked absolutely devastated, buildings on both side of the road totally destroyed ...Outside what was once the vibrant Sari Club, there was nothing standing with a crater 1.5 metres [5 feet] deep where the bomb went off and now a puddle of water." Now, if you have a 5 feet wide crater, caused by a nuclear explosion, the width of the crater should be 12.8 feet [4 meters] wide. Listen to this news story confirm the 4 meters width of the crater. "The Sari Club in the resort of Kuta - a nightspot popular with Western tourists - was reduced to a heap of smouldering ruins by the blast, which also wrecked nearby discos, restaurants and a hotel. It gouged out a four-metre-wide crater." Remember these facts, for they will play a significant role at the end of this article. If a nuclear device producing a 5-foot deep crater that is 13 feet wide [4 meters], people at least several kilometers away could hear and feel the explosion. Listen to this story confirm that detail. "The shockwaves caused by the two explosions could be felt two kilometres away, he said. It caused the walls of his hotel around the corner to shake and other buildings in the area had their windows blown out. 'We got back to the room and it felt like someone was banging on the shutters,' he said, adding that there was now a crater around the area where the car bomb had exploded." "At the very minimum the damage caused in the Kuta Beach area would require an 8,000 pound HE blast-bomb of the sort used on London during the Second World War. Problem! How on earth do you squeeze 8,000 pounds of very bulky low-specific-gravity HE into a twelve-inch diameter sewerage pipe, located nearly five feet underground? Obviously what you need is a specialized weapon significantly less than twelve inches in diameter, but with a blast capability significantly in excess of 8,000 pounds of conventional explosive. Believe me people, there is only one weapon for the job, which explains why you will probably never see the damning crater picture at the top of this page anywhere else. The blast from this weapon was so severe that its detonation terminally damaged 47 buildings in the immediate area, and trashed more than one hundred vehicles ..."
These facts seem to indicate that a small nuclear device was used. How else do you get a crater five-foot-deep and 13 feet wide, 47 buildings destroyed, over a hundred cars destroyed, skin falling off the bones, and such a high death toll? How small of a device would make this type of explosion, and who has the capability to get their hands on such a weapon? From the Brookings Institute, we get some very interesting pictures that give us a lot of detail. This information was provided courtesy of the National Resources Defense Council. 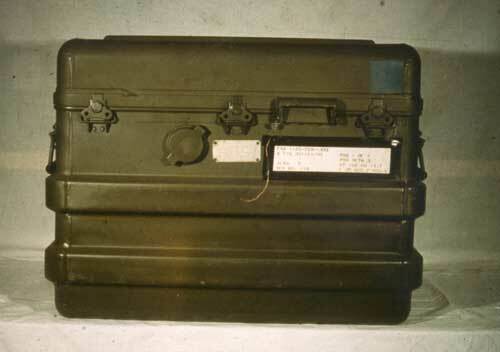 Notice that this device weighs only 163 pounds as of 1988, fully 14 years ago. It was capable of producing a blast of 0.01, or 0.02-1 kiloton and was operationally deployed between 1964 and 1988. These inclusive dates sound as if this particular device was discontinued in 1988, undoubtedly because it was superseded by other, more compact, and possibly more devastating weapons. These weapons were planned to be used primarily as land mines to slow down the approach of enemy troops; on other words, they were planned to be buried before detonation! As we quoted toward the beginning of this article, no Arab terrorist group -- including Al Qaeda -- is known to have possession of such weaponry. The list of countries who have this weaponry are: the United States, Russia, Britain, France, Israel, and maybe China! However, the United States pioneered the development of this type of weaponry, starting back late in the decade of the 1950's. "Obviously what you need is a specialized weapon significantly less than twelve inches in diameter, but with a blast capability significantly in excess of 8,000 pounds of conventional explosive. Believe me people, there is only one weapon for the job, which explains why you will probably never see the damning crater picture at the top of this page anywhere else. The actual photograph of SADM shown below is of an early version nominally rated at 10 tons TNT equivalent. More recent variants are as small as a coffee mug, though still very heavy, and have explosive yields ranging from 2 to 100 tons TNT equivalent." "High-Impact Terrorism: Proceedings of a Russian-American Workshop (2002)", The National Academies Press. Such a cloud of radioactive fallout would also dissipate rather rapidly; if officials were not on the scene quickly with radioactive monitors, the telltale signature of such a low-yield nuclear warhead would have disappeared. What potential threat to our democratic way of life is posed by a nuclear terrorist threat? Listen carefully, for the news is not good. "The public's fear of nuclear weapons -- or for that matter, of all radioactivity -- is intense. To some extent, this fear arises from a sense of unlimited vulnerability. That is, radioactivity is seen unbounded in three dimensions: distance -- it is viewed as having unlimited reach; quantity -- it is viewed as having deadly consequences in the smallest of doses ... and time-- if it does not kill you immediately, it will cause cancer decades hence." Let us repeat that most significant of statements: "Democracy cannot survive if a nuclear detonation can be detonated in ... Manhattan." Notice this statement did not say that "Democracy cannot survive if a nuclear detonation annihilates Manhattan." No, the entire city does not have to be destroyed to sow the kind of panic for which the Illuminati is seeking. 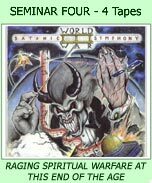 Once officials confirm that a nuclear detonation has occurred, the public misconception of the effects of a nuclear device, coupled with the scientific facts, will combine to produce the kind of panic that would allow the Illuminati to seize control. "Can you imagine what will happen if Los Angeles is hit with a 9.0 quake, New York City is destroyed by a terrorist-planted atomic bomb, World War III breaks out in the Middle East, the bank and the stock markets collapse, Extra terrestrials land on the White House lawn, food disappears from the markets, some people disappear, the Messiah presents himself to the world, and all in a very short period of time?" [Bill Cooper, Behold A Pale Horse, p. 177]. * Rapture of the Church -- "some people disappear"
This jibes with the news reports that the kill zone in the Bali Blast was in the first 200-300 feet or so. In order to extrapolate the data you have to find proportions, ratios and cube roots of the yield. The cube root of .02 is .125996 ; if you use the proportions of 100 and 1000 respectively you can arrive at the right numbers ie. the 5' x 13' crater, half kilometre to kilometer damage, and reports shock wave up to 2 kilometers. The Brookings Institute tell us: "This effect at any distance is proportional to the cube root of the weapons yield. Thus a 20 megaton bomb, which is large by today's standards, will affect only 10 times the radius of a 20 kiloton bomb - which was the yield at Hiroshima." Thus, our calculations above extrapolate the data on the Bali Blast according to this formula. But, the information on page 158 of the Russian-American symposium is even more revealing, since it tells us that we can extrapolate the data from Brookings Institute for Hiroshima and Nagasaki in order to calculate the exact weapons yield and radioactivity levels for a lower type yield as we have seen at Bali. This type of calculation is exactly what we did, above, to determine that the facts fit the news reports on the Bali Blast. 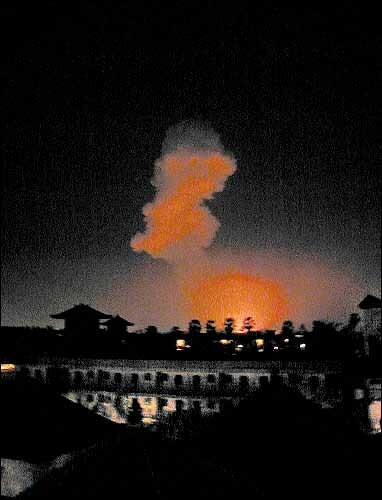 When you compare the photo of the Bali Bomb Blast above, left, with the photo of a small nuclear explosion on the Nevada Desert in 1953, they look very similar; the only major difference is that the blast in Bali was at night, in a suburban area lighted with city lights, while the Nevada Desert photo was in broad desert sunlight. The mushroom cloud is very, very similar. 4) Some values like kill distance go from almost 600 meters to 100 or less according to articles and charts. Window breakage goes from 3.2 miles or 5.2 kilometers to about 1.25 kilometers or a 1/3 of a mile which jibes with the reports of broken windows a kilometer away, and reports of major damage up to 800-900 feet about a half a kilometer away from ground zero extrapolate out as well. * "The US produced, and for many years deployed 'Atomic Demolition Munitions'. The Medium Atomic Demolition Munition (MADM) produced 1-15 kilotons of yield, and weighed 400 pounds. The Special Atomic Demolition Munition (SADM) yielded .01-1 kilotons and weighed only 163 pounds." Some disinformation has poured out of Establishment websites these past two contending the Bali Blast could not be nuclear because we do not have any warheads less than 1.0 kilotons; yet, here we see that we have nuclear warheads as small as 0.01 kilotons, exactly the type of blast in Bali. * The smallest nuclear weapon the US actually produced and fielded was the "Davy Crockett" - a recoilless rifle round. It weighed about 51 pounds, was 16 inches long and 11 inches in diameter. 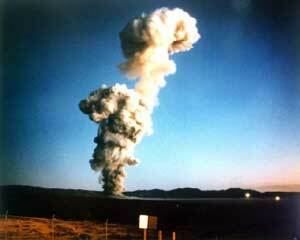 It produced a variable yield of up to 1 kiloton." Can you believe this? We developed a "rifle round", recoilless at that! Further, our troops had this weapon in 1959! The technology is very "mature"; we just have not kept pace with it, as our leaders did not want us to know how far advanced our capabilities were. The "High-Impact Terrorism: Proceedings of a Russian-American Workshop (2002)", The National Academies Press, quoted above, stated that the average citizen had significant misconceptions about nuclear weapons; during the planned terrorism phase, these misconceptions would be greatly preyed upon in order to produce the general sense of panic so needed in order to dissolve our entire system of government. * "There was no significant fallout in the vicinity of the Hiroshima and Nagasaki bombings. All radiation injuries were a result of immediate (first 1 minute) radiation." * "The only cases of significant fallout exposure (as of 1964) to individuals (other than globally ) was in the Marshall Islands after a U.S. test. The short term effects were skin 'burns'. As of 1964, no long term effects were known, although a slight excess cancer rate would be expected based on modern knowledge." * "Almost all radioactivity in fallout - even in a ground burst - comes from the fission products themselves or transmutation of parts of the weapon. Thus air bursts and ground bursts produce approximately the same amount of radioactive products. However, ground bursts cause much more of the radioactive debris to be deposited within a fallout pattern, rather than distributed (and accordingly diluted and decayed) across the entire planet." How many times have we been subjected to the scare tactic that a nuclear war could produce a "Silent Spring" for the entire planet, rendering life impossible for thousands of years? The scare tactics that have been shoved down our throats during the past 50 years is incredible, and is setting us up for the final panics. Our calculations tell us that the Bali Blast was probably one of the small tactical nuclear warheads in the vicinity of 0.01 kilotons or maybe slightly larger. All the reported facts from the Bali Blasts indicate an exceedinly small nuclear warhead that is now being passed off as a large conventional explosive that ignited gas cylinders used for cooking! But, the reported facts of the blast are consistent with our calculations produced by such a small nuclear explosion. Since the Illuminati always tests on a small scale before they go large-scale, our immediate future does not bode well for our own cities. New York City has been singled out for being hit with a terrorist nuclear bombs [Cooper, Behold A Pale Horse], but we would not exclude any large American city once the Final Birth Sorrows of World War III begin. As we have stated in many previous articles, terrorism in our cities is planned once the war begins in earnest in the Middle East. Is it possible that we are close enough to the appearance of Antichrist that the Illuminati had to test the type of nuclear device they plan to use in New York City? I believe it likely this is exactly what may be the case. Are you spiritually ready? Is your family? Are you adequately protecting your loved ones? This is the reason for this ministry, to enable you to first understand the peril facing you, and then help you develop strategies to warn and protect your loved ones. Once you have been thoroughly trained, you can also use your knowledge as a means to open the door of discussion with an unsaved person. I have been able to use it many times, and have seen people come to Jesus Christ as a result. These perilous times are also a time when we can reach many souls for Jesus Christ, making an eternal difference.